What do you think of when you hear the phrase “graphic design”? Perhaps your favorite band’s album cover or an elaborate Coca-Cola ad comes to mind? The field of design is a vast realm of concepting, creating and composing visual stories that catch the viewer’s attention. 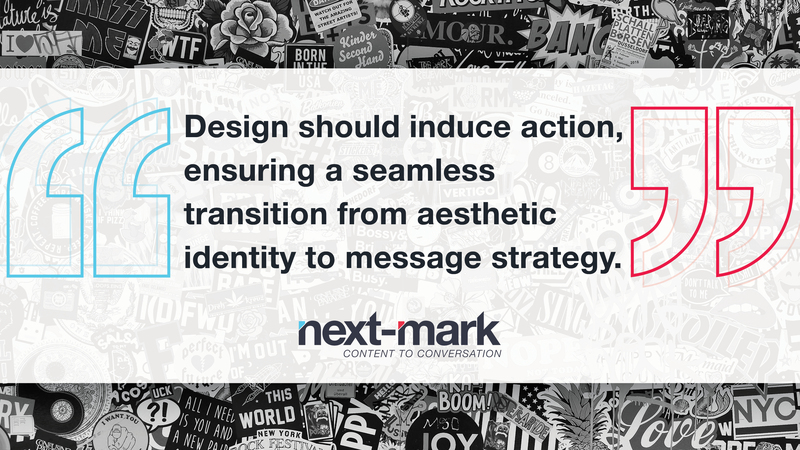 When executed flawlessly, design is thought-provoking and action-inducing – ensuring a seamless transition from aesthetic identity to message strategy. Thus, the value of strategic design cannot be understated. To marketing professionals and graphic designers, there is a distinction between something that is simply aesthetically appealing and a piece that elevates the company’s objectives. However, design is often seen as merely an aesthetic routine – make something look pretty and it will generate interest. How many times can you remember the general appearance of an advertisement, but you can’t recall which product or service it was highlighting? Design needs to do more than just look good. It has to support the company’s offerings, messaging, goals and identity. While it’s often challenging, companies need to separate themselves from their personal preferences and focus solely on strategy and the people they’re trying to reach. When a company emphasizes strategic design, merging creativity with business objectives, the results are astounding. A study by the Design Management Institute showed that companies who emphasize the importance of visual marketing outperformed the S&P by 211%. Transforming design into a strategic tool is essential to differentiate brands from their competitors and drive customer decision-making. Incorporating business strategy into the design process can take more time, but the payoff is exponential. Research: Analyzing competitors, trends, company history, touchpoints and markets is the crucial first step of any campaign. Of course, an in-depth understanding of business goals, messaging and objectives is also integral to success. Create: I’ve always believed in starting with a design that’s entirely out of the box. Incorporating strategy into design doesn’t mean that it has to be boring. Go to the outer edges of your creativity – you might just stumble upon something breathtaking. Simplify: A famous quote from Coco Chanel comes to mind: “Before you leave the house, look in the mirror and take one thing off.” The same concept applies to designing – peel back layers of design and strip away superfluous elements that will distract from the message. Simplicity is the secret to great visuals. Test: Go beyond the standard internal approval process and test your design on potential customers to eliminate bias. Most of the time, you’ll need to reframe and test again. When design is paramount to business strategy and intertwined in messaging, objectives and market approach, it becomes a powerful tool. Companies who learn to develop a culture that sees design as more than simply an aesthetic medium will reap powerful results. Is it time for you to re-evaluate the use of design in your marketing strategy? Call us and let’s get started.